It is hard to imagine the medical field without MRI scanners. 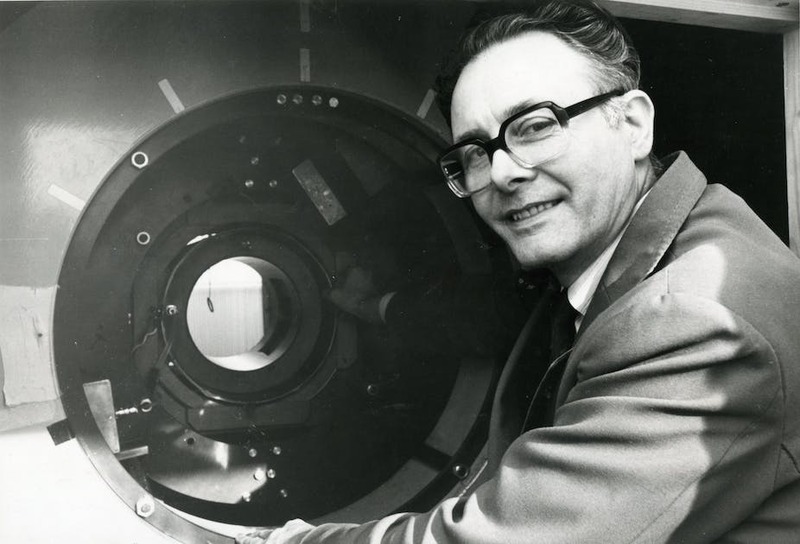 One of the pioneers and inventors of MRI machines, Sir Peter Manfield passed away on February 8, 2017, in England at the age of 83. Today, use of MRI is ubiquitous. It is used to examine injuries to bones, tissues, ligament and organs. Unlike X-rays or CT scans, there is no radiation exposure in MRI (Magnetic Resonance Imaging), as it uses a magnetic field. The name of the technology for medical uses was renamed to a friendlier name of MRI, removing reference of “nuclear” from the original name, NMR. Sir Peter continued his work at The University of Nottingham for his entire career, retiring in 1994. He pioneered functional MRI, which enables one to study functions of living organs like brain and heart. He continued to collaborate passionately with colleagues at the Sir Peter Mansfield Imaging Centre at The University of Nottingham. Sir Peter continued his work at The University of Nottingham for his entire career, retiring in 1994. He pioneered functional MRI, which enables one to study functions of living organs like brain and heart. He continued to collaborate passionately with colleagues at the Sir Peter Mansfield Imaging Centre at The University of Nottingham. One side note on the Nobel Prize with Sir Professor Paul Lauterbur – Although three scientists could share the prize, Dr. Raymond V. Damadian was denied that honor. Dr. Damadian had the first patent and original contributions in the field. Dr. Lauterbur, in his paper in Nature that showed the first MRI images, had publicly acknowledged Dr. Damadian as his inspiration. Dr. Damadian made the first MRI machine in 1977 named Indomitable, which produced the first images of a human subject (which was his assistant Larry Minkoff). In 1978 he founded Fonar Corporation to make commercial MRI machines. Today it is the only company making stand-up MRI machines, where the patients don’t have to lie down for a scan. Dr. Damadian did receive the prestigious Bower award from the Franklin Institute in Philadelphia in 2004. This entry was posted in Uncategorized on February 14, 2017 by techblogger. Here’s Wishing you All the Best for 2017! We wish all of you all the best in 2017! May this new year bring lots of success and happiness in your life. As we say Goodbye to 2016, let us remember the positives and try to not dwell too much on the negatives. In the USA here, we have gone through a nasty election season which saw the country more divided than ever! However, we and those in parts of the world which are conflict free have been fortunate to see peace and prosperity. We hope and pray that 2017 brings peace to more parts of the world and pray for those who have been affected by war and tragedy. Let us all pull together and do our part for making this world a better place for all of us. Here’s to all or our friends! This entry was posted in good wishes, inspirational, positive thinking and tagged good wishes, happy new year on December 18, 2016 by techblogger. Contrary to common belief, you have to start thinking of planning exiting your business several years in advance. 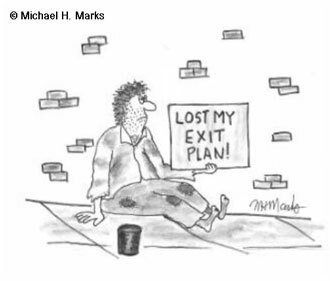 And even if you do not want to exit the business for many years to come, we strongly advise business owners to think about exit planning. One of the reasons you do this is to improve the way you run the business so that you can improve the value of your business. Even if you have no intention of selling, the steps that you take in running your business better have other benefits – It helps improve your cash flow, allows you to have more money in your pocket, and most importantly, it will give you more time for you and your family and decrease the stress of running the business. Value Builder Platform identified eight factors that influence the value of the business. One of the important factors is that you do not run your business using “Hub and Spoke” model. This model is very common in the airline industry where all the flights of an airline converge at one hub before going to their destinations. Whereas there is value for this in the airline industry, many entrepreneurs, and small business owners run their businesses so that they become the “hub”. Everyone comes to them for advice and sign-offs and all decisions, big and small, are made by them. By promoting other people in your organization to take up most of these responsibilities and building a management team. you become less important and you have less stress and more time. For more on how Value Builder Platform can help you run your business better, please visit this page and take a 13-minute survey to get your Free Value Builder score. Here is to a less stressful and more productive 2017! This entry was posted in Business Advice, business strategy, business valuation, efficiency, small business and tagged delegation, efficiency, exit planning, increasing value, valuation on December 18, 2016 by techblogger. Do You know How Much Your Company is Worth? We usually keep tab of money in the bank, how much our stocks, bonds, and other investments are worth and how much our home and real estate investments are worth. And we know how much debt we are in – either from a mortgage, student loans, car loans or other loans. We use these numbers to calculate our net worth, and it helps us build a nest egg for retirement. However, strangely, many entrepreneurs have no idea of how much their business might be worth. Your business could be one of the biggest assets that you may have. It is an investment of time, labor, and your financial investments. Shouldn’t you know the value of your business and try to protect and grow its value just like your other assets? You can hire a valuation expert or an M&A advisor/business broker to get some idea about the value of your business, or you can run some back of the envelope type of calculations to get a rough idea based on your financial performance. Very often, for small businesses with gross revenues under $5 million, you will see that the value is often 2-3 times discretionary earnings (DE, also known as seller’s discretionary cash flow) or 2.5-4 times adjusted EBITDA (Earnings before Interest, Taxes, Depreciation, and Amortization). In many industries rules of thumb also calculate valuation based on a multiple of gross revenue (e.g. dentist practice is often said to be worth between 0.5-0.7 times revenue). However, for me, cash flow, either as DE or EBITDA is a better measure because a substantial revenue without profits does not do much. 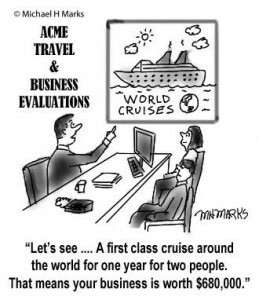 If you are like entrepreneurs shown in this cartoon, who can go on a world cruise for a year, then I would say that you have probably done well – both from profiting from your business and running the business. You have put your business on auto-pilot so that you have a management team who can run the business with minimum involvement from you. As a business owner, you want to take yourself out of a situation where the business cannot run without you. As we teach in our Value Builder advisory practice, this is one of the eight key drivers for driving the value of your business (see here for the other seven). As 2017 is just around the corner, I hope you too will more attention to your business and see how you can grow your investment in it by taking small steps to build value. Our Value Builder score is a quick way to know in 13 minutes of where you are in terms of improving your valuation. 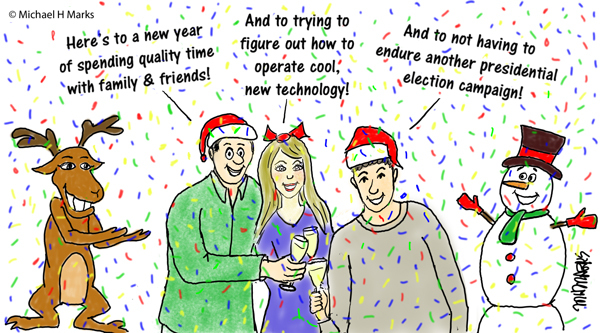 From all of us at TechnologyPark.com, cheers for the new year! This entry was posted in Business Advice, business strategy, business valuation, efficiency, small business, Uncategorized and tagged business advice, business value, valuation on December 18, 2016 by techblogger. Ideally, you want to have as little inventory on hand as possible in your business. Afterall keeping a lot of inventory, ties down your money. 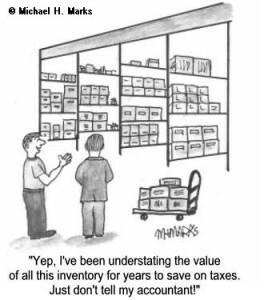 Having to keep a large amount of inventory on hand means that your money is sitting idle and not making money for you. Large Inventory costs also affects the value of the business. If in addition to the business, if they have to also buy a large amount of inventory, their return on investment becomes smaller and you have a smaller pool of buyer. However, some businesses are unique and they need to keep a large inventory. For example, if your business is built on buying very old cars, restoring them, and selling them for a fat profit, you will try and buy old cars whenever they become available, restore these and then sell them for a fat profit. And you may have several years of inventory sitting with you. However, a typical buyer who is looking for buying your business based on cash flow, will not only have to pay for the value of the business based on the cash flow, but also buy the inventory which may not generate profit for some time, but still needs the inventory to generate profits. In such cases, one may have to come with some creative ideas. We came across a similar situation where this Company services and sells refurbished equipment of a very specialized make that is currently not manufactured and the owner was contemplating selling his business. Based on current sales, the Company had 3-4 years of inventory in stock. One of the ideas that we suggested to them was that the they would create a supply / management agreement with the buyer where they would supply the refurbished equipment to the buyer over a period of time, and build in a profit component in it. It will be somewhat similar to seller’s note but with higher return as he is also providing some service. Otherwise the buyer would have to pay over $2 million more for inventory for a business that is generating about $500K of earnings, and would be a difficult proposition. This entry was posted in Business Advice, business valuation, efficiency, small business and tagged business advice, business operation, delegation, work-life balance on October 8, 2016 by techblogger. A common occurrence in many small businesses is that the owner makes all of the important decisions. After starting and building the business, owners are afraid to relinquish control. They do not feel that the others are capable of running the business like they can. So you are constantly juggling various tasks and making every decision. This is what we describe in the Value Builder System as “Hub and Spoke” system. You as the owner are the Hub and everyone else is the spoke. This can also happen if you are not the owner but a manager where you are making all the decisions. But what happens when you, the Hub, are away? Things don’t get done. And as a result you have a hard time to get away from work. You may not have taken a vacation in years. Not only this is stressful to you, it is also very inefficient and demoralizing for your employees (or those who work under you). And more importantly, this will drag your value down value. Research by the Value-Builder team has shown that businesses following the Hub-and-Spoke model, where owners are in control of most of the decisions, sell on an average of 2.92 times their pre-tax profit. However, the businesses where the owner is not significantly involved in day to day operation and has management team and employees empowered to make decisions and running day-to day operations, sell on an average of 4.54 times the pre-tax profit. By making your business much less dependent on you, you can increase the value of your business by 55%! Not only that, you will have happier employees and less stress for you. You can now afford to take vacation. But how do you do this? To start with, create operating manuals for your company. Write detailed procedures for everything that needs to be done. For each job function, you have a system or operating manual describing what needs to be done. Once you have these ready, train your employees to follow the processes and systems and give them the right tools. To quote Michael Gerber in E-Myth Revisited: “Organize around business functions, not people. Build systems within each business function. Let systems run the business and people run the systems. People come and go but the systems remain constant“. How does McDonald’s delivers the same burgers and same experience across thousands of outlets – they have the system and procedures nailed down. Making yourself as a business owner (or manager) less important and having a system in place is just one of the eight value drivers that improves the overall valuation of your company. If you are curious about what is your score on this ValueBuilder scale, take this 13 minute survey. This entry was posted in Business Advice, business strategy, business valuation, efficiency, small business and tagged business advice, business efficiency, business operation, business value, delegation, valuation, work-life balance on October 7, 2016 by techblogger. Small business owners add personal expenses into business expenses to show less income and hence pay less taxes. Minimizing tax liability is a strategy all business owners think about. 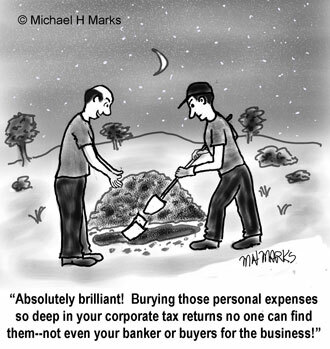 But when it is time to obtain financing or sell the business, buried personal expenses and assets can create a problem in determining the true cash flow. When showing cash flow, we as advisors, usually adjust the cash-flow by adding non-business expenses to the bottom line – these are commonly referred to as add-backs. Some of the add-backs are easy to show or defend – e.g. salaries and benefits paid to a non-working family member, or owner’s retirement savings, or even a personal car paid for and maintained by the Company. Others are more difficult to defend. For example some of the personal expenses charged on company credit card, gifts for family members bought on company expense, personal travel mixed in with business travel, and the list goes on. The problem is that the buyers and bankers won’t always give credit to many of these items. As a result, the cash flow can be suspect. And when you apply a multiplier to determine the value of the business, the results can be disappointing. For example, many small businesses (say up to about $10 million or so, typically sell at multiples of about 2.5-4 of adjusted EBITDA. So if you tried to shield say $100K of profit by putting personal expenses on the company account, you may lose up to $400K of valuation on your Company. Even worse is when one does not even report some of the income on the books. This seems to be more common in certain main street businesses where cash transaction is common. One of the businesses which we were trying to sell had a cash component to it (selling parts). The owner’s Tax Returns showed an annual income of about $600K. However, he swears that his real income (and cash flow) is at least $100-150K higher. Problem is how can you prove it? And who will believe it? Had he reported his true income. the business would have been very attractive, it would have found ready buyers and bank would have been willing to finance it. 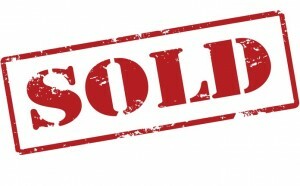 As it turns out, banks are not willing to finance it at the price he is looking for, and the business is not attractive to the buyers (and hence has not sold). So, it is in the best interest of a business owner to show a healthy bottom line in the years preceding the sale of their business to get the highest price possible, and make it attractive for buyers and lenders. This entry was posted in Business Advice, business valuation, expenses, hiding income, small business on August 9, 2016 by techblogger. Whereas most of you might have had experience selling your home, you may not have had an experience in selling a business. 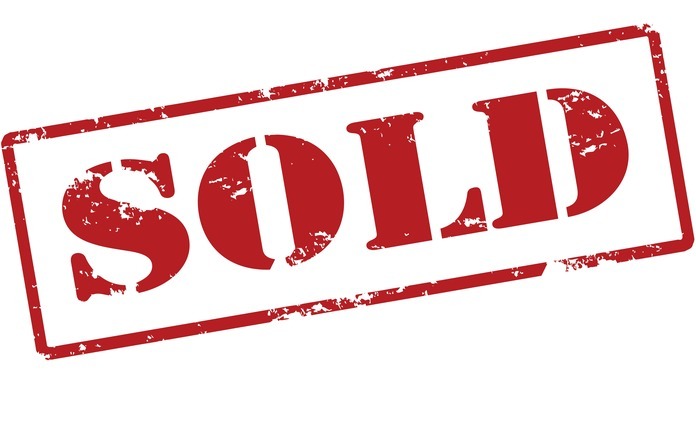 Whether you are selling a home or your business, your goals are the same: Sell it quickly and get the best price. To do this, in the case of your home, typically you want to clean up the home, remove all clutter, fix up things that are broken, and stage it to look attractive. In some ways, selling a business involves similar things – fix areas that may need fixing, keep clean books and easy to understand financials, and make sure that the business runs smoothly and your place of business looks attractive and presentable. But in contrast to selling a home, making a business sellable and being able to get top dollars, often can take a year or several years of preparation. The best strategy is to run the business so that it can be easily sold even if you are not planning to sell it. This will only make your business stronger and more profitable, easier to run, and if it becomes necessary for you to sell your business, you are prepared. Healthy Business. Most of the buyers are looking for a business that is healthy, making money, and can provide for good income for them. Exceptions are start-up businesses which have good potential for a strategic buyer, or someone who loves a challenge of turning a business around and is looking to buy such a business for cheap. (Somewhat similar to home buyers who are looking for move-in ready homes versus fixer-uppers). Most of the time, we find that it is very hard to find buyers who want to buy a business making little or no money. The value of the business also improves significantly if it generates healthy profits. Business is on Auto-Pilot. Which means that there is an excellent management team in place, with good processes and standard operating procedures. It requires very little input of the owner in day to day running of the business. This also increases the value of the business significantly because the buyer does not have to bring in expensive management team. “Sticky” Customers. 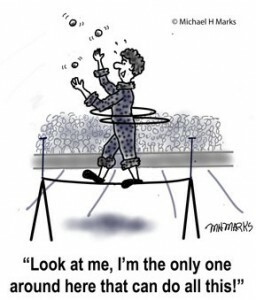 Customers are heart and soul of the business and nothing pleases a buyer more than to see that these customers are ‘sticky’ and ideally are tied to the business via long-term contracts, providing consistent revenues every year. Getting new customers is not easy – one of the main reason people buy a business rather than starting from scratch. Sticky customers will improve the value of your business. Diversified Customer Base. Buying a business where a high percentage of business is dependent on a few customers is risky for the buyer. If that customer leaves, the business will suffer. Ideally, no single customer should be responsible for more than 5-10% of the revenue, unless that customer does have a long-term contract. Happy and Competent Employees and Management Team. If the employees have a high morale and management team is doing a great job, the transition to the new owner becomes seamless. No Legal Issues. No one wants this headache. Clean Financials. Buyers don’t like “fuzzy” financials and mingling of personal and business expenses. Keep your books clean. Whereas some personal finances are easier to explain (e.g. certain management perks such as car allowances, Life insurance payments), others cannot be and you will unnecessarily create distrust for the buyer. You maybe save some on taxes, but lose out on the value and attractiveness of your company. Keep it Lean and Trim. Always try and curtail unnecessary or extravagant expenses and keep your margins high. This does not mean paying too little to your employees or not giving them good benefits (these are short term savings that does not help you long-term), but it does mean investing in tools and processes that help you run your business efficiently, improving productivity, focusing on the profitable segments of your business and cutting down on frivolous expenses. Stand-out from your Competition. Buyers would love a business that is somewhat different. This could be due to some unique technology or product, could be from particular branding, or could be from niche business focus. A stand-out business would attract strategic buyers and almost certainly bring you good value. Business Reputation. Finally, does your business enjoy a good reputaion in the marketplace? Are your customers happy or fanatic about your service? Are employees talking good things about your company? Is there any regulatory or legal trouble? Buyers would love such businesses. Knowing what most buyers are looking for will help you make your company more attractive to buyers and also will help you get top dollar for your business. You can also read an excellent book by John Warrillow, called Built To Sell. He also runs very interesting podcasts on the subject. Another great book, that emphasizes “Work on your business and not in your business”, called E-Myth Revisited by Michael Gerber is also a classic, that is a great read, and will help you run the business smoother and in turn make is more sellable. Coming up next … How much is my business worth? This entry was posted in Business Advice, business strategy, business valuation and tagged business advice, business efficiency, business operation, business value, exit planning, exit strategy, sellable business on January 7, 2016 by techblogger. Sometimes Less is more. Less time for work that is. Today, work-day often is 24×7 affair, particularly if you are running your own small business. You are always checking your emails, answering emails from your prospects or customers. Although you may be seemingly enjoying your weekend or vacation, it is often hard to get away from work completely. I used to be that way too. But lately, I have found that getting away from work completely, say for weekends or on short vacations, actually rejuvenates you and make you more productive. And you get just as much done in the allotted time, if not more. Remember the famous Parkinson’s Law: “Work Expands to fill the available time for its completion”? This statement, first made in 1955 by British author Cyril Parkinson for an article for “The Economist” is one of the most profound observation. So when you reclaim your personal time to be spent with family, friends, and on non-work things, you end up compressing the time available to finish the work and you manage to do it! This past memorial day was amazing. Our two sons were back from college and with us for a few days. The week before my older “twin” boy (older by 7 minutes), declared that on Memorial Day, we were going to clean up both, our garage and basement. Our detached garage (which is actually used as a workshop and storage area) had become a complete mess – it was impossible to make your way from the front to the back). Basement had also piles of paper and stuff – things that we collect. So we had a three day deadline to clean up the mess that we created over past 10-15 years. Actually we got a late start on Saturday, but by 3 pm we had over half the stuff in the garage separated out as trash to be thrown out. And we discovered how great the “1-800-Got-Junk” was. While we were creating a giant pile in the driveway for a trash hauler, I was pleasantly surprised that I could book a time for Got-Junk people to come an haul away all the junk the same day in the 3-5 pm window! So with 3 pm deadline looming (which was just about 3-4 hours since we started our clean-up), we had to finish separating out the trash in just a few hours. And true to Parkinson’s law, we managed to do it. On Sunday, while my sons put up some organizers and shelves in garage and organized the tools and other stuff in the garage, me and my wife tackled the basement and got it completely cleaned and organized by Monday evening. One long weekend, two seemingly endless tasks, done very well and within the available time. One more victory for the Parkinson’s law. Yes, with Teamwork, focused energy, and a hard deadline, we are capable of doing amazing things. But we are after-all humans – we need to be reminded of this often. Do you find yourself procrastinating on things that must be done? Or always falling behind in your tasks? And always stressing out because things are not getting done? Or working all the time? We needlessly stress out on things on our “To-do” Lists, make complicated plans, give our tasks unnecessarily long time lines and then put them off till the last minute because we fear tackling them. And keep reminding yourself about Parkinson’s Law every time you try getting stressedI love Nike’s slogan – ‘Just do it’. Instead of endless planning, just plunge ahead and start tackling things you are putting off. This entry was posted in Business Advice, efficiency, health, positive thinking, small business, work life balance and tagged family time, parkinson's law, work efficiency, work-life balance on May 27, 2015 by techblogger.